If you are looking for information on reverse mortgages, then this article is the perfect place to start. Specifically, we will discuss several parameters and circumstances in which reverse mortgages should be considered to help you improve your financial situation. Reverse mortgages are usually reserved for seniors or older homeowners, who are equity rich. Technically, the word senior refers to those over 62 years of age. A reverse mortgage will release to the homeowner, the equity that is available in the home — either in one large loan, or in multiple smaller payments. The homeowner is not required to make annual payments on the loan. The loan is only to be paid off after the homeowner passes away and the property is sold, or the owner is forced to move from the home, having to move into assisted living quarters or aged care facility. Here is more information on reverse mortgages that you need to know — if the value of your property increases after you receive your first reverse mortgage, it is possible you for you to file for a second or even third reverse mortgage to get the equity from the home. However, for some countries, this is not permitted — like in the United States; you are only allowed one reverse mortgage. Other than being 62 years of age or older, and having equity in your home, there are no other requirements for your loan. You do not have to earn a certain amount, or have a certain credit score or history. When you are given a reverse mortgage loan, you can spend it on whatever you desire with only one exception. The exception is the existing mortgage or mortgages must be paid off first with the money you receive from the reverse mortgage. If you are going to file for a reverse mortgage loan, you have to first seek free financial counseling from a source approved by HUD, the Department of Housing and Urban Development. This is required to make sure you fully understand the terms of the reverse mortgage loan. The money you receive from a reverse mortgage loan comes from the value that has been appraised on your property, the current interest rate, and your age, how you receive the payment, and the location of your property. The amount that can be borrowed is dependent on a number of different factors, the most common factors include age, value of home, payment method selected, current interest rate, and the reverse mortgage type selected. Some counties also have hard capped limits on the amount that can be borrowed. Lenders generally limit the amount that can be borrowed to 40% of the value of the home and there is a hard limit of $625,000 for FHA/HUD reverse mortgages. If a senior is interested in more than that then they need to investigate what is known as a jumbo or proprietary reverse mortgage. The costs of a reverse mortgage vary a lot but in general, you can expect to pay approximately $6,000+ in total. 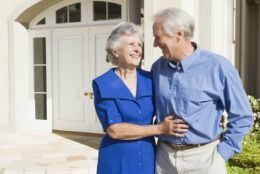 This amount can be taken from the reverse mortgage itself, the only money borrowers need to get going is for the real estate valuation which usually costs around $300. The costs can be broken into the following items; origination fee (maximum cap of $6,000. 2% for the first $200,000 and 1% thereafter), mortgage insurance (2% of the real estate valuation), title insurance (varies state by state) and legal fees. In some cases a land/house survey will also need to be conducted which usually costs around $400. Reverse mortgage lenders quite often charge a monthly fee; this ranges from $25-$35. It is important to take all of these fees into account when doing calculations (our calculator makes it easy to consider fees). The lenders for single purpose reverse mortgages are usually non-profits or local governments. These loans can only be used for one specific purpose (thus the name), for example, a local municipality may offer a reverse mortgage to seniors that can only be used to pay for their rates. A non-profit may offer a reverse mortgage for medical expenses. This is the least common type of reverse mortgage and in general, it has lower origination fees, ongoing fees and in some cases lowers interest rates. They are by nature quite restrictive which often makes them an unattractive option for seniors who need a loan for a variety of reasons. That said they are often over looked due to them not being available in all areas. If a borrower is looking for a loan for one specific purpose, it may be worth investigating a single purpose reverse mortgage. These are also commonly known as HECM loan, these are insured by HUD (department of housing and development) and are the most commonly used reverse mortgage currently in the market place. Financial institutions provide these, they are commonly extremely large loans sometimes also known as a jumbo reverse mortgage. By using a reverse mortgage calculator, you are able to see the value of your house, reverse mortgage outstanding and the equity remaining over time. If you have a specific question, you can always contact us, or ask in the comments section. Steve Thompson is a college student pursuing his Bachelor’s Degree in Business Management.